Documents (and their associated files) are all publishable documents (except Data Access Request). 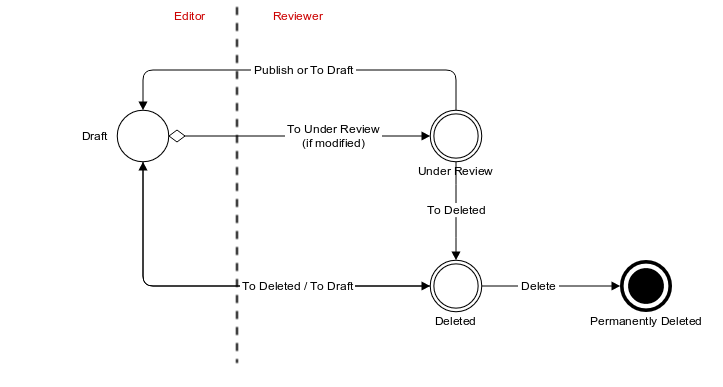 Being a publishable document means that there can be different revisions of the document before being published. The publishable document goes through several states allowing to separate user privileges: some users will be responsible for the content edition only, while other users will be responsible for the reviewing and the publication of the document. A draft document can be changed/edited as many times as necessary. When the edition work is done, the document is staged for being reviewed. The state of the document that is reviewed is the one that will be published. Once the review and the publication is done, the document is ready again for edition. When a document is to be removed, it is first marked as being deleted (without affecting the publication) before being permanently removed. The document is in the editable state. published nor deleted, it can only be staged for these operations. To Under Review Once changes have be saved, the document is ready to be reviewed. can return to the draft state for edition. To Deleted Approval for document deletion is requested. it is removed from the publication repository.